UNSD/UNEP Questionnaires on Environment Statistics, Waste section. Eurostat Environmental Data Centre on Waste (http://epp.eurostat.ec.europa.eu/portal/page/portal/waste/key_waste_streams/municipal_waste). OECD Environmental Data Compendium, Waste section. Data may include municipal waste collected from previous year. Data refer to total waste generation. Data refer to household waste generated. Data refer to the amount of municipal waste generated. Value refers to the main island of Tortola only. These are estimates based on household and marketplace surveys conducted in 1996 and 2004 in 13 regions of Burkina Faso. The estimates include only the urban population, since rural waste is dispersed in the environment and is usually combined with agricultural waste. Data refer to household waste only. Composting: from residential and non-residential sources. Excluding construction waste, aluminium cans and metal-containing waste measured in cubic metres or other unit. Data refer to by-products produced form incineration and untreated waste transported to landfill. All wastes transported to the incineration plant, including those collected from households, sea and commercial and industrial activities. In 2009 the figure include shares of 34% exported for recycling. Includes landfilling of residues from other treatment operations. Data refer to waste treated by municipalities and separate collection for recycling by the private sector. Direct disposal (excluding residues from other treatments, 6.6 million t.). Data refer to amounts directly recycled (incl. private collection) and recovered from intermediate processing. Large increases in the amount of municipal waste collected between 2008 and 2009 are a result of changes made in reporting of municipal service activity, particularly an enlarged scope of data collection. Also, in 2009 municipal waste collection authorities began work in additional settlements not covered previously. Household waste is imported from France and Italy for incineration with energy. Data refer to recycling and composting together. Data include landfilled household waste and recycled packaging waste. Landfill: household waste excluding construction and demolition waste. Data refer to solid waste reaching dumping site which was taken from the Dumping Site Survey implemented in 2001. 2009 excluding Azores and Madeira (2,5% of total population). Includes biodegradable waste selectively collected (13%). Municipal waste includes industrial waste from manufacturing industries. Includes ash from incineration plants. 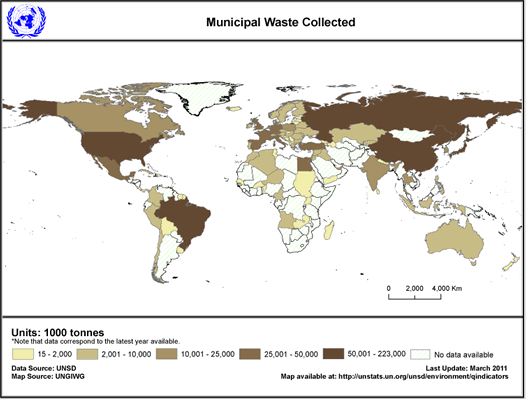 Data pertains to domestic waste (4,100,000 t/year), municipal rubble and soil (1,000,000 t/year), green waste in coastal towns (40,000 t/year), and building waste (1,900,000 t/year). Data pertains to automobile waste. Data are collected through the regular annual survey on municipal waste for the reference year 2008 for the first time. The source of data are municipal enterprises that collected municipal waste. For areas not covered by a municipal waste collection system, the amount of waste generated is estimated. The methodology is fully compiled with EU Regulation 2150/2002. Landfill: after recovery and incineration. The quantity of municipal waste collected is about 40% of the total annual municipal waste generated in the Republic. Municipal waste, collected by or on behalf of municipalities, by public or private enterprises, includes waste originating from: households, commerce and trade, small businesses, office buildings and institutions (schools, hospitals, government buildings). It also includes bulky waste (e.g., white goods, old furniture, mattresses) and waste from selected municipal services, e.g., waste from park and garden maintenance, waste from street cleaning services (street sweepings, the content of litter containers, market cleansing waste), if managed as waste. The definition excludes waste from municipal sewage network and treatment, municipal construction and demolition waste. Municipal waste collected refers to waste collected by or on behalf of municipalities, as well as municipal waste collected by the private sector. It includes mixed waste, and fractions collected separately for recovery operations (through door-to-door collection and/or through voluntary deposits). Landfilling is final placement of waste into or onto the land in a controlled or uncontrolled way. The definition covers both landfilling in internal sites (i.e., where a generator of waste is carrying out its own waste disposal at the place of generation) and in external sites. Municipal waste landfilled includes all amounts going to landfill, either directly, or after sorting and/or treatment, as well as residues from recovery and disposal operations going to landfill. The definition covers both landfill in internal sites (i.e. where a generator of waste is carrying out its own waste disposal at the place of generation) and in external sites. Incineration is the controlled combustion of waste with or without energy recovery. Recycling is defined as any reprocessing of waste material in a production process that diverts it from the waste stream, except reuse as fuel. Both reprocessing as the same type of product, and for different purposes should be included. Recycling within industrial plants i.e. at the place of generation should be excluded. Composting is a biological process that submits biodegradable waste to anaerobic or aerobic decomposition, and that results in a product that is recovered and can be used to increase soil fertility. The sum of the different types of waste disposal may be greater than the total amount of municipal waste collected, as these facilities may be used for other types of waste, or because of double counting due to the landfilling of the residues of incineration, or to the incineration of residues from composting. - Amounts of waste will vary, depending on the extent that municipal waste collection covers small industries and the services sector. - Waste collected by the informal sector, waste generated in areas not covered by the municipal waste collection system or illegally dumped waste are not included. Caution is therefore advised when comparing countries.